What will you do? I chose to make a wedding card. I previously made a birthday cake card for a friend almost like this using DSP instead of textured card stock. She really liked it. With wedding season coming up (I have one invite for spring, summer and fall already) I needed to have some wedding cards on hand. This is traditional, but I jazzed it up a bit with the textures and the bling of pearls on top of the softness of teh rosettes. I love it! You could do this in any wedding colors by using color card stock or using marker on your embossing folder for color. Then color your rosettes with marker or ink pads. I've heard that Copic markers color pearls just fine, but I don't own any of those. What will you come up with? 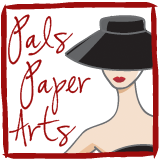 Please join us as we play with Fashion Inspiration at Pals Paper Arts! 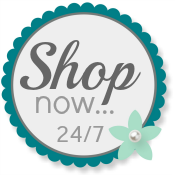 When you need products from Stampin' Up! please use my website to order. This is gorgeous - love all of the white and texture! A scrumptious wedding cake! Patti I love this card. It is so elegant and classic. I love all the texture - what a fun way to create a cake. I hope you don't mind if I case this one. Patti this is gorgeous. LOVE the white on white look and the use of the tulip edge on the cake is genious! LOVE the flower rosettes - one of my favs- and they are a perfect finishing touch with the those adorable pearls! Hugs. Love the use of Vanilla. You really captured the feeling of the inspiration photo. This is your finest work! I love this whole card - everything about it. From the cleaver way you used the tulip embossing folder to the Perfect Polka-Dots cake - it's perfect! Such blogger mayhem the last two days! So I am leaving another comment to tell you I love this scrump-dilly-icious cake! Thank you, Linda! It couldn't have happened on a more popular card! I think my most-commented card ever! I love this Patti ... elegant and classy! Tried to comment before but good 'ole Blogger is not cooperating at all. It keeps taking my post down ... crazy! This card is so elegant. I wish I had a wedding soon. But I'll CASE it anyway, because it will be such a gorgeous addition to my sample basket! I'm back after Blogger! This card is absolutely fabulous, Patti! I think it is my all-time favorite of all of your cards...a masterpiece for sure!